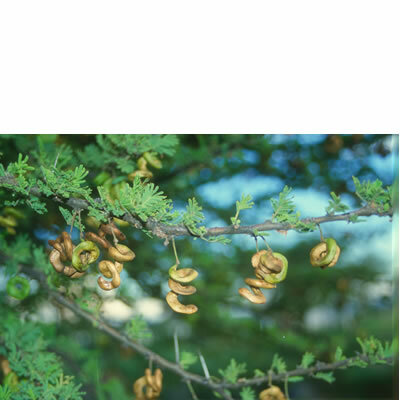 Acacia tortilis, Umbrella Thorn (e), Haak-en-steek (a), umSasane (z) Hardy, evergreen, drought resistant, slow growing umbrella-shaped Acacia with abundant, fragrant, white, puffball flowers from Nov. to Jan. followed by distinctive curled pods that rattle in the wind. It has both hooked and straight thorns. This is the typical Acacia associated with the African savannah. It is a little slow growing but worth the wait as it develops a beautiful umbrella shape. It is an indicator of sweet veld and has a preference for deep soils. It can also be planted in smaller gardens as it rarely grows into a very big tree. Attracts birds and butterflies to the garden. Size 5 to 20m Locality : Kimberley. Date of harvest : Oct 2018.